The middle-class model of America, with good-paying jobs all around — it’s over. We aren’t going back to the 1950s. It’s impossible. That’s where President Barack Obama’s JOBS plan has got to start. If President Obama starts with a goal that can’t possibly be achieved, his presidency is finished. People must be made aware of reality. The America of the 1950s was a unique golden age. America had just won the big war, America was the only power standing, America was the economic giant of the world. In large part, that era of prosperity was made possible by the old imperialist-colonial model, sucking resources from the undeveloped world, taking the resources home and adding value through manufacturing, with all the profits going to enrich the home country. That world no longer exists. We cannot live in the past, and we cannot live in denial. We must learn to survive in the flat-world economy of the 21st century. If we set our goal as a win-lose competition with the rest of the world, we lose. Period. The rest of the world is no longer going to allow America to consume the lion’s share of the world’s wealth. There is plenty of work that needs to be done in America — rebuilding the roads and water systems, healing the sick, teaching the young, caring for the old, producing food and housing for ourselves, with some left over to share with the rest of the world. We must find a way to energize our people to do the work. We must organize our economy in a way that permits us to fairly compensate people. I’m not at all sure that we will do what needs to be done. We must have leadership. I’m thinking leadership like FDR or Winston Churchill. Now, Mr. President, please define clearly: What is the realistic goal for American prosperity in the 21st century? After that, you can proceed with your JOBS plan. 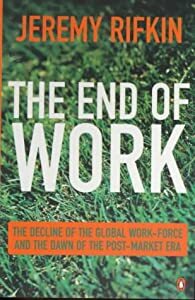 This entry was posted in Books, Democracy, Economy, Frugal living and tagged America, Barack Obama, Change, Employment, Jobs, Middle class, Social justice, Unemployment, Wealth, Work, Working class by Editor (Retired). Bookmark the permalink.